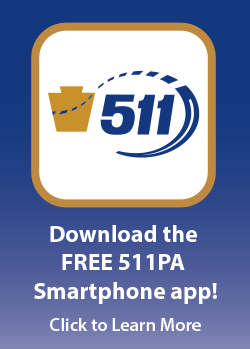 The Commonwealth of Pennsylvania (Commonwealth), acting through the Pennsylvania Department of Transportation (PennDOT), offers the 511 PA website as a public service. This website is intended to be used by the general public for viewing and retrieving information only. Unauthorized attempts to upload or change the information on this website is strictly prohibited and may be subject to sanctions under the Computer and Fraud Abuse Act of 1986, as amended. Access to and use of this website is provided subject to the acceptance of this disclaimer, the terms that appear below, and the policies set forth on PennDOT’s home page at: Web Policies. Please read all these provisions carefully as use of this site constitutes acceptance of these terms and conditions. Unless otherwise stated, the Commonwealth and PennDOT own the intellectual property rights in this website (site) and the content on this site. All intellectual property rights are reserved. Where a work is intended to be dedicated to the public domain, a statement to this effect is indicated at the top of the work. This provision includes but shall not be limited to intellectual property (e.g. videos) created by vendors on behalf of the Department. No commercial use of this intellectual property shall be made without the express written permission of PennDOT. You must not republish material from this website (including republication on other sites), or reproduce or store material from this site in any public or private retrieval system. You must not reproduce, duplicate, copy, sell, resell, or otherwise exploit this site or material on this site for a commercial purpose, without the express written permission of PennDOT. You must not edit or otherwise modify any material on the site. PennDOT makes no claims, promises, or guarantees about the completeness, or adequacy of the content of this website and expressly disclaims liability for errors and omissions in the content of this website. No warranty of any kind, implied, express, or statutory, including, but not limited to the warranties of non-infringement of third party rights, title, merchantability, fitness for a particular purpose and freedom from computer virus, is given with respect to the content of this website to any specific commercial products, processes, or services. PennDOT is a distributor of content provided by third parties. Any information or content expressed or made available by third parties, including information providers, users, or others are those of the respective author(s) and distributor(s) and do not necessarily state or reflect those of PennDOT and shall not be used for advertising or product endorsement purposes. Reference to any specific commercial products or the use of any trade name, firm name, or corporate name is for the information and convenience of the public, and does not constitute endorsement, recommendation or preference by PennDOT. PennDOT has obtained the requisite permission to link to the other sites that appear on this website. PennDOT is not responsible for the content of any off-site pages referenced. The links are made available to assist the website user in his or her search. PennDOT takes no responsibility in the links’ operation or content. By clicking any of these links, you could leave PennDOT’s website and enter a private-owned site created, operated or maintained by a private business or non-Commonwealth government agency. By linking to other sites maintained by other private sector or non-Commonwealth agencies, PennDOT is not endorsing its products, services, or security policies. Any concerns about these external links should be directed to the site administrator or Webmaster for that link. Due to the variable nature of the Internet, PennDOT does not warrant that service will be uninterrupted or error free. The documents and related graphics published on this server could contain technical inaccuracies. Additions and changes are periodically made to the content on this site. PennDOT may make improvements and/or changes at any time. Construction of the these disclaimers and resolution of disputes are governed by the laws of the Commonwealth of Pennsylvania. The laws of the Commonwealth of Pennsylvania shall apply to all uses of data and this website. When using this service, 511PA will be sending text messages to your mobile phone containing traveler information based on your notification preferences. When you opt-in to the service, we will send you an SMS message to confirm your signup. You can cancel this service at any time. Just text "STOP" to 34421. After you send the message "STOP" to us, we will place we will send you a reply message to confirm that you have been unsubscribed from all travel alert services. After this, you will no longer receive messages. If you want to join again, just sign up as you did the first time and we will start sending messages to you again. You can place the service on "vacation mode" at any time by logging in to your 511PA Personal Alerts account or by texting "PAUSE" to 34421. After you send the message "PAUSE" to us, we will suspend your notifications. When you want to start receiving messages again, you can come off vacation mode by logging in to your 511PA Personal Alerts account, or by texting "START" to 34421. If at any time you forget what keywords are supported, just text "HELP" to 34421. After you send the message "HELP" to us, we will respond with these instructions. We are able to deliver messages to the following mobile phone carriers: Major Carriers: AT&T, Verizon Wireless, Sprint, T-Mobile Minor Carriers: U.S. Cellular, Boost Mobile, MetroPCS, Virgin Mobile, Alaska Communications Systems (ACS), Appalachian Wireless (EKN), Bluegrass Cellular, Cellular One of East Central, IL (ECIT), Cellular One of Northeast Pennsylvania, Cricket, Coral Wireless (Mobi PCS), COX, Cross, Element Mobile (Flat Wireless), Epic Touch (Elkhart Telephone), GCI, Golden State, Hawkeye (Chat Mobility), Hawkeye (NW Missouri), Illinois Valley Cellular, Inland Cellular, iWireless (Iowa Wireless), Keystone Wireless (Immix Wireless/PC Man), Mosaic (Consolidated or CTC Telecom), Nex-Tech Wireless, NTelos, Panhandle Communications, Pioneer, Plateau (Texas RSA 3 Ltd), Revol, RINA, Simmetry (TMP Corporation), Thumb Cellular, Union Wireless, United Wireless, Viaero Wireless, and West Central (WCC or 5 Star Wireless). SMS restrictions and account limitations: If you are attempting to register for this service and have not received the SMS text message confirming your registration, or you do not receive a response when you attempt to reply to the message, then it is likely that your mobile phone account is configured to block text messages from Short Codes. Short codes are non-standard phone numbers, and may also be known as Promotional Codes or Computer Generated Codes. To fix this, contact your wireless phone carrier and ask that they enable your account to receive text messages from the Short Code 34421.. Make sure to inquire how long it will take for the change to be effective so that you can try again.